Donated by: Tim Conolly, Glaxo Wellcome. The 7475A was the follow on product to the 7470. Like the 7470, it used paper-moving technology. It also had a 6-pen carousel and could plot on both A/A4 and B/A3 size paper. The 7475A had a 6-pen carousel instead of an 8-pen carousel so it wouldn't overlap with the market for the yet-to-be-released 7550. 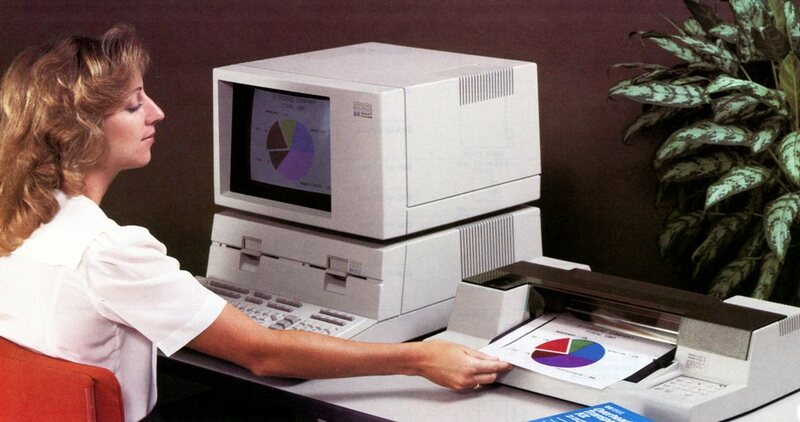 In 1984, the 7475 was the most profitable single product within HP. HP had over 75% worldwide market share in small plotters with no major competitors outside Japan. HP could charge a premium for its products because the price benchmark was normally made against the previous generation HP model rather than against a competitor. The 7475 was a beneficiary of Lotus 1-2-3 software and the IBM PC and compatibles. 1-2-3 had a very crude graphics utility called "Printgragh". But it brought business graphics creation and printing to mainstream computer users for the first time. 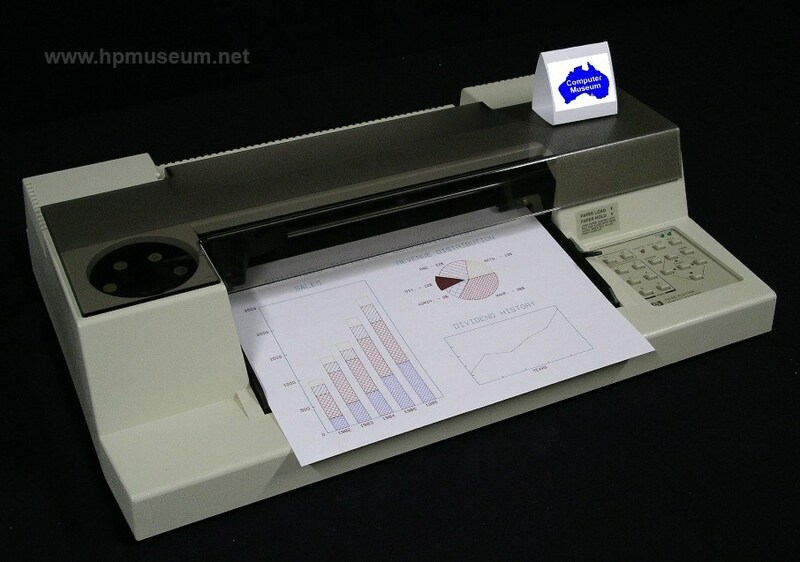 The 7475 was the most popular pen plotter ever made. It was not obsoleted until 1994, an amazing 11 year product life. At a fraction of the price and with better performance, the 7475A was a major advance over the 9872C that it replaced. Though it carried two pens fewer than the 9872C (which held eight pens), this was of little significance to users. Some traditional HP customers were suspicious of the light weight of the 7475A (Could it really be as good as the 9872C if it was that cheap and that light?). The 7475A did not match the 9872 in two areas. The new product did not offer the option of a roll feed attachment for long axis plotting. The 7475A also did not support liquid ink drafting pens for use with high-stability mylar film. Because of the small size of the market, HP was not concerned with the lack of long axis plotting for the 7475A. 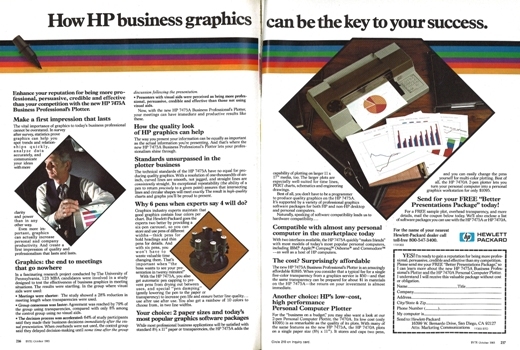 However, in 1985 HP introduced a special carousel for the product which allowed it to use the same short-body liquid ink pens that were used by the 9872. HP sold more 7475A's into the drafting applications than all of the 758X family combined. The 7475A had a minor technical glitch that was never corrected by HP. When drawing the figure "8" using internal character sets, the 7475A drew an "8" with a flat, rather than rounded, top. This problem was only ever noticed by some customers in Japan, so it was not corrected by HP. HP made a minor mechanical modification to the 7475A in 1985. The original 7475A had a mechanical paper stop attached to the paper hold lever. This allowed users to load media in exactly the right place by both sight and feel. HP eliminated the paper stop and replaced it with a painted white line. This modification was made as a result of a then-pending lawsuit with competitor Houston Instruments as a defensive measure. HP ended up winning the lawsuit, so the product change proved unnecessary in hindsight. 7475s are very reliable. All five units that have come through the museum have worked perfectly. To run the internal demo plot, hold down the P1 and P2 keys and turn on the power. ©2004 - 2019 BGImages Australia - All Rights Reserved. The HP Computer Museum and BGImages Australia are not affiliated with HP Inc. or with Hewlett Packard Enterprise. Hewlett Packard and the HP logo are trademarks of HP Inc and Hewlett Packard Enterprise. This website is intended solely for research and education purposes.